Continuing my exploration of the Azure SDK for Go, the next project is to start tinkering with IP restrictions for Azure App Services. The way I usually use App Services (and attempt to make them remotely secure) is to have an API Management instance in front of an App Service. The App Service is then configured to only accept traffic from the APIM (and maybe the office/home IPs). As usual, go get (literally) the Azure-sdk-for-go project at github. The key parts of working with network restrictions are 1) getting the app service and 2) getting the site configs. Here we’re just getting the entire list of app services though ListComplete then going through the pages of results, searching for a given prefix and storing the ones I’m interested in. Now that we have the list of app services (most importantly the list of resource groups and app service names) we can start getting configurations for them. Here we’re just looping over the app services we retrieved earlier. Using the resource group and names we’re able to get the configuration for the given app service using ListConfigurationsComplete method. This returns a slice of SiteConfigurationResource structs. From there we can inspect all the juicy details. In the above case we’d loop over cv.IPSecurityRestrictions and get details such as IP restriction rule name, priority, IP address mask etc. All the details we want to confirm we’re restricting the way we’d like to. If we then want to modify/add a rule, you simply call client.UpdateConfiguration passing resource group, app service name and most importantly the instance of SiteConfigResource that holds the above information. Hey presto, you have a new rule created/updated. After quite a number of comments about having some consistent tools to perform basic operations on Azure Storage resources (blobs, queues and tables) I’ve decided to write up a new set of tools called “Azure Storage Tools” (man I’m original with naming, I should be in marketing). Be able to do all the common operations for blobs/queues/tables. eg. for blobs we should be able to create container, upload/download blobs, list blobs etc. You get the idea. Instead of a single tool that provides blobs, queues and tables in one binary, I’ve decided to split this into 3, one for each type of resource. First cab off the rank is for blobs! The tool/binary name is astblob (again, marketing GENIUS at work!!). If a picture is worth a thousand words, here’s 3 thousand words worth. 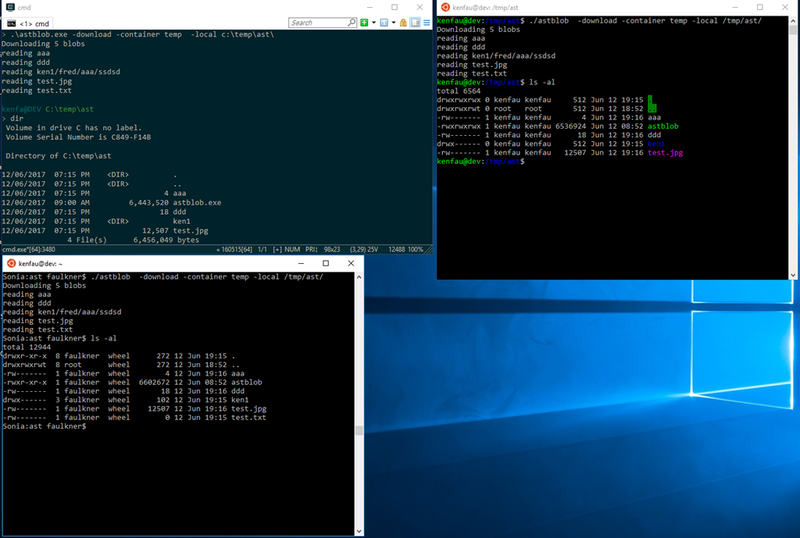 Firstly, in this image we have 3 machines all running astblob, a Windows machine, Linux machine and OSX machine. Each of them are connected to the same Azure Storage container (configured through environment variables), and we’re simply asking for the containers in that Azure Storage account. Easy enough. Now, for some more details. Here we’re asking for the blob contents of the “temp” container. Remember Azure (like S3) doesn’t really have the concept of directories within containers/buckets. The blobs have ‘/’ in them to “fake” directories, but really they’re just part of the blob name. So now what happens if we download the temp container? Here we download the temp container to some place on the local filesystem. You’ll see that the blob name that had “fake” directories in it’s name has actually had the directories made for real (executive decision made there… by FAR I believe this is what is wanted). You’ll see in both Windows and the *nix environments that that “ken1” directory was made and within them (although not shown in the screen shot) the files are contained within. AST blob is just the first tool from the AST suite to be released. The plan is that Queue and Tables will follow shortly, also for more functionality for Blobs to be released. The download for AST is at Github and binary releases are under the usual releases link there. 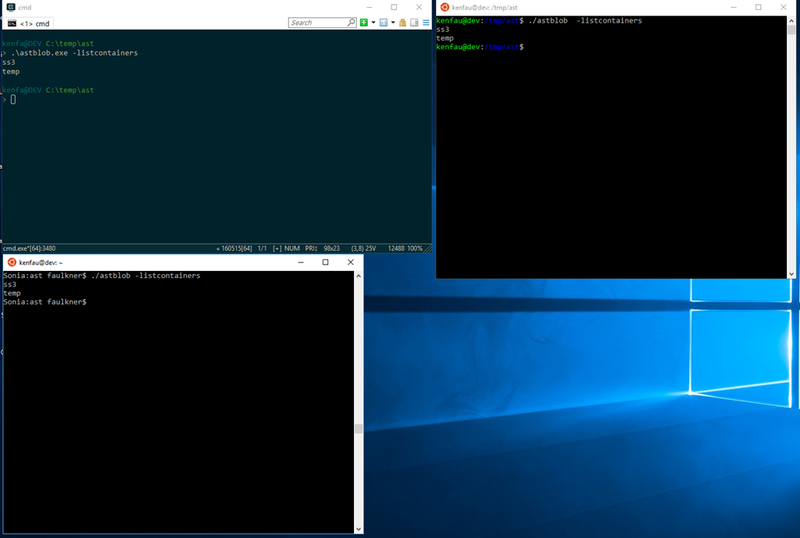 Binaries are generated for Windows, OSX, Linux, FreeBSD, OpenBSD and NetBSD (all with 386 and AMD64 variants) although only Windows, Linux and OSX have been tested by me personally. The AST tools (although 3 separate binaries) will all be self contained. The ASTBlob binary is literally a single binary, no associated libs need to be copied along with it. Before anyone comments, yes the official Azure CLI 2 handles all of the above and more but it has more dependencies (rather than a single binary) and is also a lot more complex. AST is just aimed at simple/common tasks…. Hopefully more people will find a consistent tool across multiple platforms useful! While working on a PR for the Azure storage GO library I discovered (yet another) corner of Go that confused the hell out of me. I know enough about embedded types/structs to use them effectively (so I thought) and I know the difference between receivers and pointer receivers. But when using them together you really need to make sure you’re careful. Please please PLEASE note that this is a pointer receiver! Now I’d spend an embarrassingly long time trying to figure out why when I tried to marshal my BatchEntity class, why it didn’t call this MarshalJSON method as I expected. Of course it turned out that when I passed the marshalling method BatchEntity.Entity (referencing the embedded type) it would *somehow* (I haven’t figure out the specifics yet) treat it as a regular receiver and not call the MarshalJSON method since that specifically had a pointer receiver. I still need to dig into the details but this is a big warning to me, when dealing with embedded types make sure you check the receivers of the base structs. Would have saved me hours!!! Kind of surprised there wasn’t a compile warning/error around that…. but I need to dig further. The key thing is the –copyblob flag. This tells AzureCopy to do it’s magic! I’m a HUGE Azure Webjob fan, they’re so useful for a wide variety of scenarios. Being able to setup a Webjob listening to an input queue and just throw messages at it is such a nice way to do adhoc data processing. Azure Functions is a nice improvement over Webjobs (but basically do the same thing). Whereas Webjobs are constantly running in the context of you Application Service (and potentially using up your App Service quotas), Azure Functions aren’t tied to App Service plans and best of all, you’re only charged for when they’re actually processing something. Setup them up and if they don’t process anything for a month, you get charged nothing. You don’t need to tear them down and restart them, they’re just there ready and waiting. 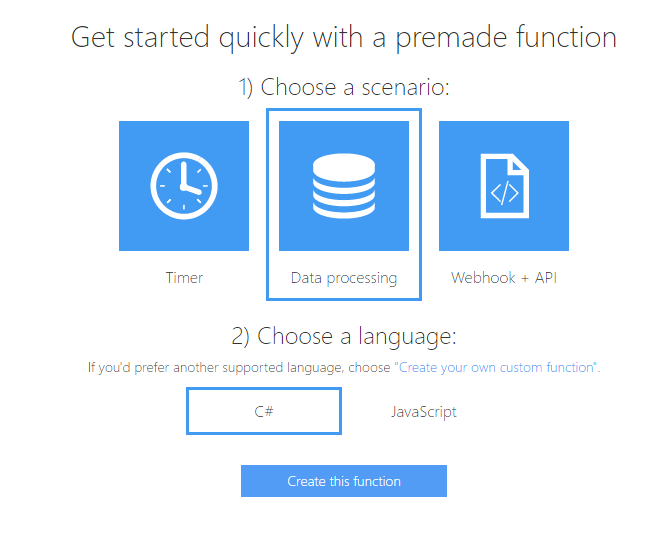 Firstly, setting up an Azure Function is pretty straight forward (under a minute to complete). Essentially go to the Azure Functions Portal (you can also do it via the regular Azure Portal) , give your function a name and region then hit “create”. It’s THAT easy! Then you have a LOT of options for triggering the processing of data. Expand to see all the options, then select QueueTrigger-Batch (if you want to use queues that is, which I do). Now that we have configured the function will really be triggered by a batch file we can make it in turn call our Go compiled binary (yes, I keep talking about Go here, but in reality this will work for any executable regardless of the language it was coded in). The input queue message is converted into an environment variable (see line 2), then we call azurefunction.exe. Where does Azure Functions know about azurefunction.exe? Click on the “view files” then “upload”, then you can upload any files required for processing the messages. One last thing to do in the portal is to specify how the Azure Function returns its results. In my case I also want the output to be via Azure Queues. To enable this, select Integrate on the left menu, select New Output and then Azure Queue Storage. In this example my super sophisticated Azure Function will count the number of characters in the input message and send that result to the output message. Rocket Surgery for the win! // just write the length to the queue location. Just to prove this works. The code is extremely simple. The input messages comes from the “inputMessage” environment variable. We get the location of the output file via the “outputQueueItem” environment variable. We create a file at that location, write the results (length of input) and hey presto, one usable Azure Function! Now, we compile this and upload via the Azure portal (mentioned earlier). Now for testing! Select “Develop” on the left hand menu on the Azure Portal (see screenshot below) and then on the “test” button on the right hand side. This will allow you put some test inputs on the queue and check the results. Enter some test data. In the above case I just entered “abcde” then hit RUN. You can see some of the debugging in the lower window. The input has been read, data processed and result thrown onto a queue (check your azure queue with your favourite azure viewing tool). Now, given this is all just a batch file wrapper, you can see that the time to execute isn’t brilliant. You can see the entire process was about 750ms, and 600ms of that seems to be just the firing up of the azurefunction.exe executable from the batch file. Still, I think that being able to set these up, and “almost” fire and forget about them is really nice. You’re only charged for the time they’re running. I’ll definitely be tinkering with these more, I can see them being hugely useful! Being able to copy from one cloud provider to another is useful, but if everything is purely serial (ie one blob at a time) the time taken to copy everything might be less than stellar. I’ve now released a new version of AzureCopy-Go (0.2.1) which allows concurrently copying of blobs. The default is 5, but using the –cc flag (concurrent copying) it can be expanded up to 1000 (arbitrary max limit). So far, so good! Also, for this release I’ve build the binaries using the AMAZING Gox project. This allows for easy cross compiling for Go. So we now have Linux, FreeBSD, NetBSD, OpenBSD, Darwin (MacOS) and Windows binaries. For the most part we have 3 variations of each platform binary, one each for ARM, AMD64 and 386. I knew how to get cross compiling with Go on Linux/MacOS but could never get it working on Windows (current main OS). Gox is definitely a time saver and is so damned easy to use. Please give AzureCopy-Go 0.2.1 a try if you have any S3 <—> Azure migration needs. More features being worked on every few days.